I’ve covered a number of products in Mac Gems that extend Mail’s capabilities, Some, such as MailTags, Mail Act-On, and MailEnhancer, add significant new features, whereas others, such as Letterbox and DockStar, simply add viewing enhancements that make Mail more useable. Today’s Gems are somewhere in between; they add new features, but ones that are so simple they look like they’ve always been there—and likely should have been. Have you ever wanted to re-send a message to a recipient with a comment or additional information? In other words, to follow up on the message? You can select a message in Mail’s Sent mailbox and then choose Send Again from the Message menu, but that just gives you an identical copy of the original. If you want a clear follow-up , you should somehow indicate what was the content of the original message and what’s your follow-up text. 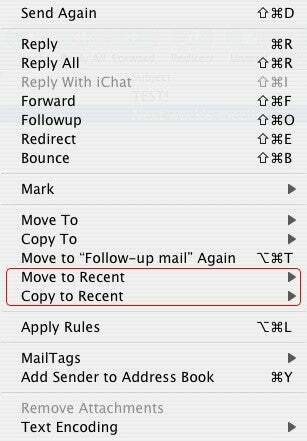 Gregory Welch’s MailFollowup 1.0.4 ( ; free) is a Mail plug-in that does just that. After installing MailFollowup—using the included installer, or by manually dragging the MailFollowup.mailbundle package into ~/Library/Mail/Bundles—Mail’s Message and contextual menus host a new Followup item. 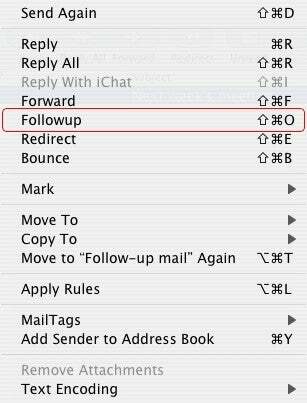 If you don’t want to include all of the original message in your follow-up, just select the text you want to include and then choose the Followup command. It’s true that you can approximate this functionality by using the Reply or Reply All command and then rearranging recipient addresses. But why go to all that trouble when MailFollowup makes the process simple and easy? Gregory’s other plug-in, MailRecent 1.0 ( ; free), makes viewing and filing your mail easier. 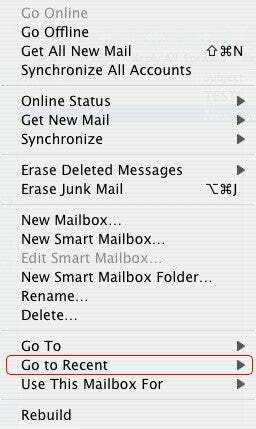 Once installed, you get three new menu items: Messages: Move to Recent; Messages: Copy to Recent; and Mailboxes: Go to Recent. The third new option, Go to Recent, switches the main Mail window view to the folder you choose; like the other two new menus, its sub-menu is populated with those folders to which you’ve recently moved or copied a message. How many recent items are listed? That’s determined by the “Number of Recent Items” setting for Documents in the Appearance pane of System Preferences. (Which means that this setting must be set to something other than None for the plug-in to have any usefulness.) Unfortunately, none of these new sub-menus lists folders you’ve simply viewed ; rather, they list only those folders to which you’ve actually moved or copied a message, either by using the Move To command or by dragging-and-dropping a message from one folder/mailbox to another. 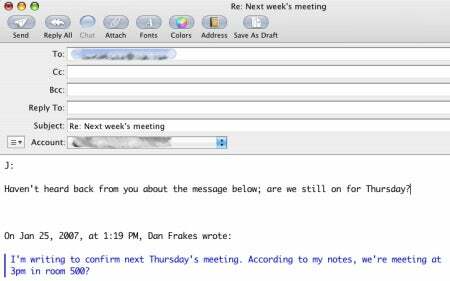 MailFollowup and MailRecent require Mac OS X 10.4.1 or later—and the corresponding version of Mail—and are Universal binaries.